Because the outer shape of the room gimp pulley (outer shape plastic) was broken, the same pulley was purchased from the manufacturer, the part where the power of the wire is applied The pulley was broken, so I am using the Eastern pulley close to the equivalent searching on the Internet, Since I have not had any problems so far, I purchased 6 items this time. As for improvement, washer of shaft insertion Waist of thickness 5 mm 2 sheets attached and if it widens the width of the wire part I wonder if the other is OK. This review is about item#39462053. A wire for moving the roof of the astronomical observation building, I tried using it as a tension roller to adjust the winding height of the winch with the tow portion. Although I made my own bearing, I adjusted the size of the bearing and the diameter of the washer, designed the width of the bearing to 16 mm, I tried using the shaft screw tightly but it seems to be very smooth motion tone is good. Resin made pulley became gorigori, I was looking for alternative products, but it is the best! I am very satisfied. The movement is smooth, and it can withstand considerable load. I ordered additional as a spare. Half a year after purchasing a home gym and using it, a rattle and sound began to come out of the pulley bearings and when the bearings came out, the bearings broke apart. And I examined it in various ways and found this pulley 90. 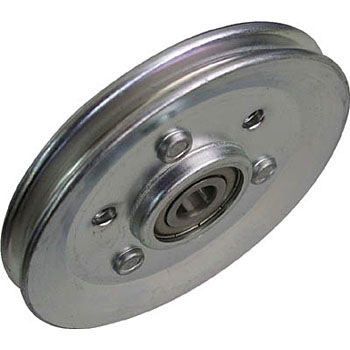 After exchanging with pulley 90, the sound is also quiet and outstanding to use. I used it as a pulley of a rat machine. It is as smooth as resistance is too smooth. Other people can also write, it is a replacement for plastic training pulley for weight training. At the time of rowing motion, when using heavy weight plastic pulley was damaged and replaced. The feeling of use is smooth, extremely, it is preeminent. It is recommended for those who use it for the same purpose as me. I used a training machine called a rat pull machine, but since the pulley with the most weight of the weight stack pulverized to pieces apart, I reached here, looking for a pulley depending on the size. I think that the pulley attached from the beginning is made of plastic, so we lost weight. This pulley 90 is about the same diameter as the pulley attached from the beginning, but the width is considerably thin. There is no problem in the feeling that I tried. Manufacturers of training machines also have a repair pulley, but because it is also plastic, it is absolutely recommended if you replace it. Because the bearings are included, it is more comfortable to wear than ever and can be used comfortably. I think that it is OK as it is. DX Home Used this item because the pulley of the gym was broken. Although the size is the same, we bite the washer because the width is narrow. The feeling is that the sound moves quietly and smoothly. It is only durability. I'd like to purchase again.